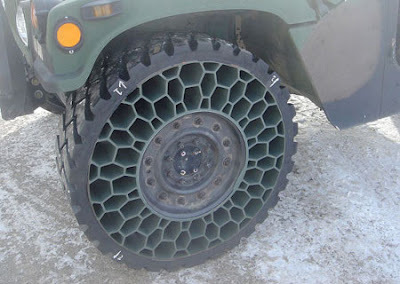 Resilient Technologies's "non-pneumatic tire" (NPT) is designed to continue supporting the Humvee get troops out of harm's way even if a roadside landmine or small arms attack destroys up to 30 percent of the tire's honeycomb structure. In April, Resilient installed a set of 37-inch (94-centimeter) NPTs on a Wausau-based National Guard Humvee, which is currently being tested. Although Resilient won't say exactly what polymers and other materials it uses to make its NPTs, the company designed them with a bolt pattern compatible and interchangeable with current Humvee wheel designs.